I used to think that “smell” represented the least valuable sense when piloting an aircraft. 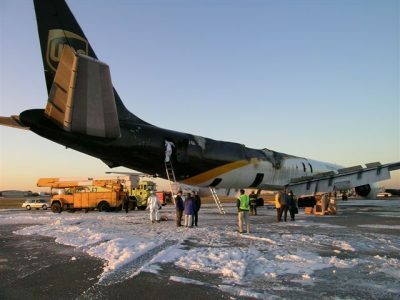 On February 8th, however, it turned out to be just the opposite, because the crew of this UPS DC-8 did smell something about 23 minutes prior to their scheduled landing in Philadelphia: smoke. The crew immediately declared an emergency. Three minutes before landing, the smoke/fire warning light illuminated, and the jet burst into flames upon touchdown at Philadelphia. The crew evacuated the aircraft via the cockpit windows using escape ropes provided for that purpose (you can see the ropes dangling from the cockpit window in the first photo). It took more than four hours for firefighters to extinguish the blaze. The aircraft was a complete loss, but there were no injuries. 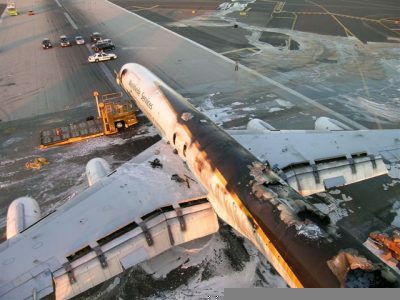 When your aircraft catches on fire, that’s all that really matters. 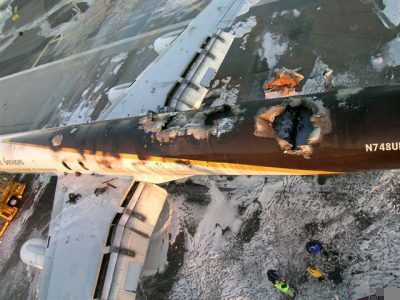 Apparently there were two hazmat materials being carried aboard the DC-8: amyl methyl ketone and tire repair kits. Fire is one of the worst things a pilot can encounter in the air. 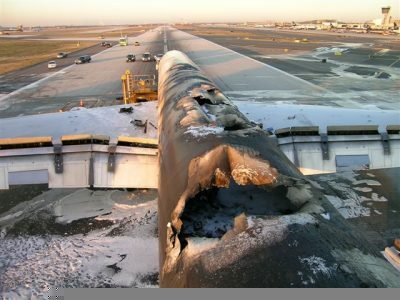 This accident was probably caused by the cargo, but in general aviation aircraft, fires are usually fed by electrical problems and/or fuel. There just isn’t a whole lot else that’s flammable on board an airplane. I teach my students that at the first sign of fire — whether that be smoke, flames, or just a burning smell — the best course of action is to kill the master switch and eliminate everything electrical. Many electrical systems, especially older ones, have wiring insulation made out of PVC-like material. When burned, a byproduct of combustion is cyanide gas. Electrical fires are nothing to mess with. If you suspect a fire, shut off the master switch immediately. When you’re VMC, this is an easy call. Most of us spend the vast majority of our time in visual conditions, so that’s the de facto solution. In the soup it’s a little tougher. 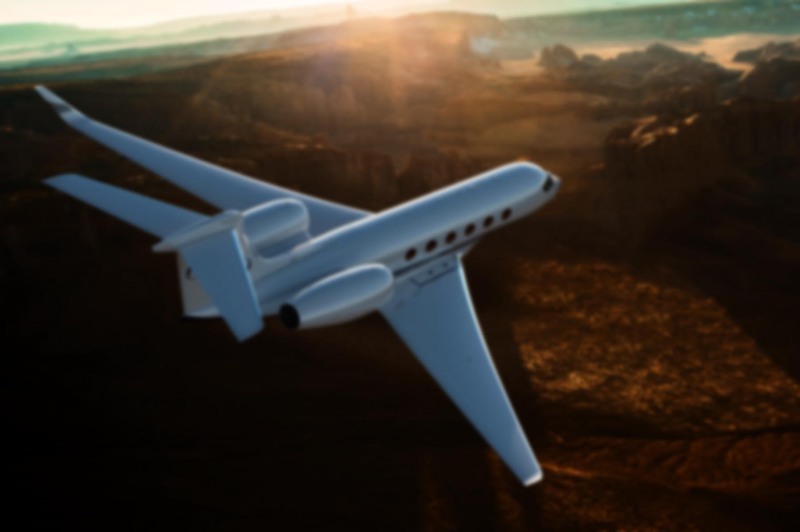 Airplanes with air-driven flight instruments will continue to function, but the proliferation of all-electric glass panel airplanes has made shutting off the electrical system a bit more complicated. The two main glass panel airplanes out there are the G1000 and the Avidyne FlightMax Entegra. The G1000 system I’m most familiar with is the one in the DA40 DiamondStar. Here, you can shut off both sides of the master switch with impunity, because a small emergency battery exists to power the standby attitude indicator and flood light. In the Cirrus, however, you cannot do this. Battery 2 powers the standby attitude indicator. The best answer in the Cirrus is to shut off alternator 1, battery 1, and alternator 2. Leave battery 2 on to power just the essential items. Since battery 2 powers the essential buss directly — bypassing the Master Control Unit and the essential distribution bus — most of the electrical equipment in the airplane will have been shut off, and therefore whatever’s causing the problem will hopefully also be rendered inoperative. If the problem does not abate, however, then battery 2 should be shut off and the ballistic recovery system deployed. In some airplanes — and I’m thinking of the Extra 300 and Pitts S-2B here — there aren’t many electrical items. However, you do have the main fuel tank inside the cockpit. In fact, it sits right above the knees of the guy riding in the front seat! An ideal place? No. But that’s how it is. The Pitts is even worse because the analog fuel gauge (basically a bit of translucent tubing) brings the gas into the rear cockpit, too. I haven’t come up with as many bright ideas for dealing with a fuel fire in a small, closed cockpit. The best you can do is get the hell out of there. In most airplanes this is not an option, but in aerobatic aircraft we wear parachutes. Score one for the good guys! 1. The design and construction of most aerobatic aircraft with a fuel tank located inside the cockpit means that in a crash the probability of a fuel tank rupture and gasoline coming into contact with the pilot is virtually guaranteed. Furthermore, lets not forget that high-tech fuel gauge consisting of a piece of clear tubing that is fastened to the instrument panel of virtually every Pitts literally inches from your body! 2. Nomex® absorbs liquids like a sponge. Additionally, if you get covered in fuel, that $240 Nomex® suit is no better than a T-shirt and jeans when it comes to fire protection. While a pair of cotton jeans will do a reasonable job of insulating you from thermal energy for very short periods of time, natural fibers (cotton, wool) also have the property of not supporting combustion in the absence of external heat. Natural fibers will absorb liquids such as fuel so if you get drenched you will be toast, literally. It would however, be better to wear cotton or wool than synthetic fabrics because the natural fibers don’t support combustion nor do they melt into your skin when they do burn. You don’t fly wearing polyester or nylon against your skin, do you? A single layer suit of this material carries an SFI rating of 5 while a single layer Nomex® suit carries an SFI rating of 1. Most race car drivers are wearing this fabric either alone or in layers with other aramids such as Kevlar to gain increased fire protection. The problem of overheating and dehydration is addressed through the design and construction of the suit itself. Sewing in panels of knit Nomex® on the small of the back and shoulder areas, air circulation is achieved while minimizing the total amount of Nomex® in the suit. The bottom line is this: fire is bad and if you have one, every second counts. You can’t afford to wait until you’re smelling smoke, seeing sparks, or dodging flames before considering how you’d handle this scenario any more than you can afford to takeoff without forming a plan of action for an engine failure. Aerobatic pilots often rehearse bailout procedures before egressing the cockpit after a flight. Next time you fly, take a look around your aircraft. Think about where the fuel is, where the electrical wiring is, and how you’d respond in VMC and IMC conditions. Our intrepid UPS DC-8 crew had the benefit of recurrent Level D full-motion simulator training to prepare them for a fire. GA pilots must take charge of their own preparation for a day we pray will never come. That airplane is still sitting on the ramp in Philly. I just saw it the other day. 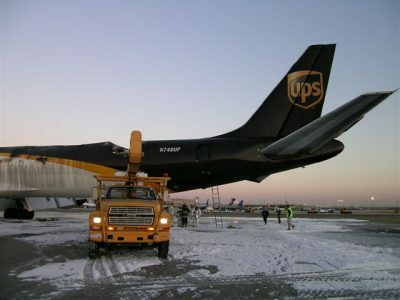 The UPS logo on the tail has been painted out, and the holes in the fuselage are covered by a blue plastic tarp. Glad no one was hurt with that one. If the fire had started 15 minutes earlier, I don’t think the outcome would have been so good. 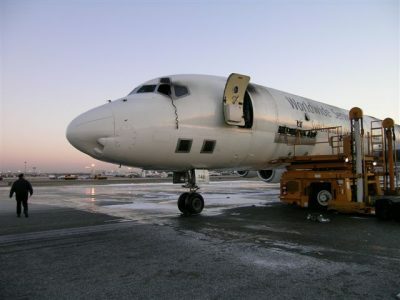 Not sure how UPS configures their cargo cans on the DC8, but usually there is a hose connected to each can allowing Halon to be directly discharged into the can where the fire is located. In the Caravan, we put all flammable material that is labeled “Cargo Aircraft Only” is supposed to be “accessible” to the pilot, so it goes into zone 1 – right behind the cargo barrier behind the pilot seats. Between the seats is a big Halon fire extinguisher. 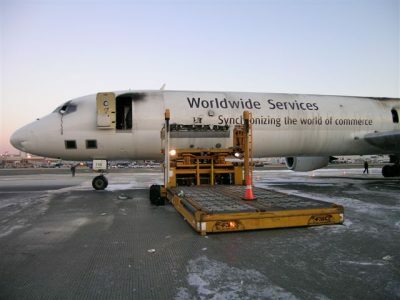 The general thinking is that if you have a cargo compartment fire, take your right hand and pull the extinguisher pin and loosen the nozzle. With your left hand, put on the quick-donning O2 mask. Then discharge the entire contents of the extinguisher with the nozzle pointed back while you begin an emergency descent. Land ASAP. My nightmare? Undeclared, unlabeled and, consequently, improperly handled hazardous material. Those folks who accept packages at the counter who quiz the customer about the contents and look for telltale signs of improper packaging are the first line of defense. God bless each and every one of them.